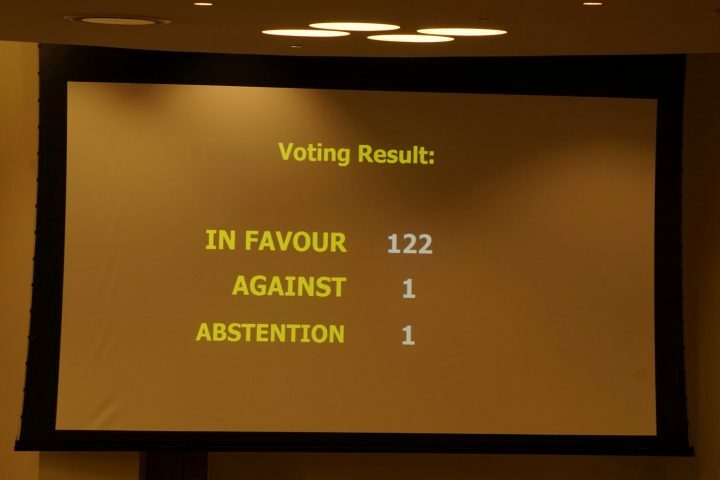 With a final vote of 122 countries in favour, 1 abstention and 1 against (The Netherlands) the conference to negotiate a treaty to prohibit nuclear weapons approves its text. The treaty opens for signature during the UN General Assembly on the 20th of September. It comes into force after fifty countries ratify it. Over 130 states have taken part in these negotiations which have come about after sustained pressure by a handful of states who are no longer prepared to leave the precarious future of humanity in the hands of those who wield the power to inflict Armageddon on us all. Just as has happened with chemical weapons, biological weapons, cluster munitions and landmines, the discourse leading to their prohibition was changed by focusing on the humanitarian impacts. This has not been an easy matter at all given that the last use of nuclear weapons in wartime was in 1945 and scarcely any survivors from Hiroshima and Nagasaki remain to give their testimonies. The victims of nuclear testing, mainly from remote, indigenous communities, without the resources to launch high profile campaigns supported by Hollywood actors and celebrities have also struggled to make their voices heard in the face of incredible difficulties. The nuclear ban treaty has been denounced by those countries who have nuclear weapons and their friends as being unrealistic, unhelpful, counterproductive and irrational. Nikki Haley, the US Ambassador to the United Nations claimed that as a mother, a daughter and a wife she couldn’t support the writing of this treaty, blithely ignoring the fact that as a women, she, and all those who share her gender, will be disproportionately affected by any nuclear detonation. This ban treaty which stands independently of the NPT treaty, as there is no need to be a signatory of the latter in order to participate in the former, fits nicely in the legal gap described in the above article because if prohibiting nuclear weapons isn’t an effective measure, then nothing is. Let’s not be naïve though, we are banning these weapons (and the ban becomes effective when the 50th country has ratified it), but in the short term not one nuclear weapon will be disarmed as a result of it. But its value lies in the stigmatisation that the ban treaty confers. In the recent NPT preparatory meeting in May in Vienna, Russia repeated the false argument used by many nuclear weapons states since 1970, that the NPT makes their possession of nuclear weapons somehow legal. Even the International Court of Justice, in its advisory opinion of 1996, found a loop hole the size of a truck through which nuclear weapons states could justify their continued possession, when it said that use of nuclear weapons may be legal in the case of a threat to “the very survival of a State”. This treaty bans nuclear weapons in all instances and closes whatever loopholes existed. Civil society (i.e. those of us who aren’t participants in military society) has fought for so long to make this happen. Among others, Abolition 2000 and, more recently, the International Campaign to Abolish Nuclear Weapons have worked with almost no resources to bring pressure to make this happen, yet ironically now the work really begins. This treaty to ban nuclear weapons, filling the legal gap as explained by Austria in the Vienna conference on the Humanitarian Consequences of Nuclear Weapons, is one of the few steps that countries without nuclear weapons could do without needing the involvement of nuclear weapons states. Now civil society, and the governments who have proactively pushed for this day to happen will need to find new avenues through which to bring pressure to bear. Surely, divestment campaigns, such as PAX’s “Don’t Bank on the Bomb” will be an important tool. Campaigns to end conflict between India and Pakistan (and China), in the Middle East and in North East Asia will be other areas where international pressure can be brought to bear. And at a domestic level, the recognition by the treaty of “the importance of peace and disarmament education in all its aspects and of raising awareness of the risks and consequences of nuclear weapons for current and future generations,” could lead to interesting initiatives, not only in the world’s classrooms, but also in the field of media and culture whose task of creating a global consciousness which is abhorrent of nuclear weapons will have a highly important role to play. But this is all for tomorrow, for today we celebrate this moment of history, we celebrate all those activists and organisations that have dedicated themselves to this struggle, we celebrate the countries whose politicians and diplomats have got us here, we celebrate that this metaphorical David has been able to defeat an insolent Goliath, and we celebrate that 72 years after nuclear hell was unleashed on the population of Japan, never again will any country be able to legally justify the possession of a weapon that has the power to destroy human civilisation and virtually all the life on the planet. Tony Robinson, co-director of Pressenza, member of the International Humanist Party and World without Wars & Violence, coordinating committee member of Abolition 2000, and author of the book "Coffee with Silo and the quest for meaning in life".